Between the first and fourth centuries, there existed a Magdalene Christianity, characterized by emphasis on ending the oppression of the world’s powerless. Unfortunately, over the long centuries, Jesus’ more inclusive message, as conveyed through Mary Magdalene, was silenced. The Orthodox Church “replaced, appropriated, and left behind” the prominence of the Magdalene. Despite official suppression and neglect, something of her significance is hinted at by the folk legends about Mary. According to tradition, Saint Mary Magdalene, who had patrician rank, gained an audience in Rome with the emperor after the Crucifixion and Resurrection of Christ. She denounced Pilate for his handling of Jesus' trial and then began to talk with Caesar about Jesus' resurrection. She picked up a hen's egg from the dinner table to illustrate her point about resurrection. Caesar was unmoved and replied that there was as much chance of a human being returning to life as there was for the egg to turn red. 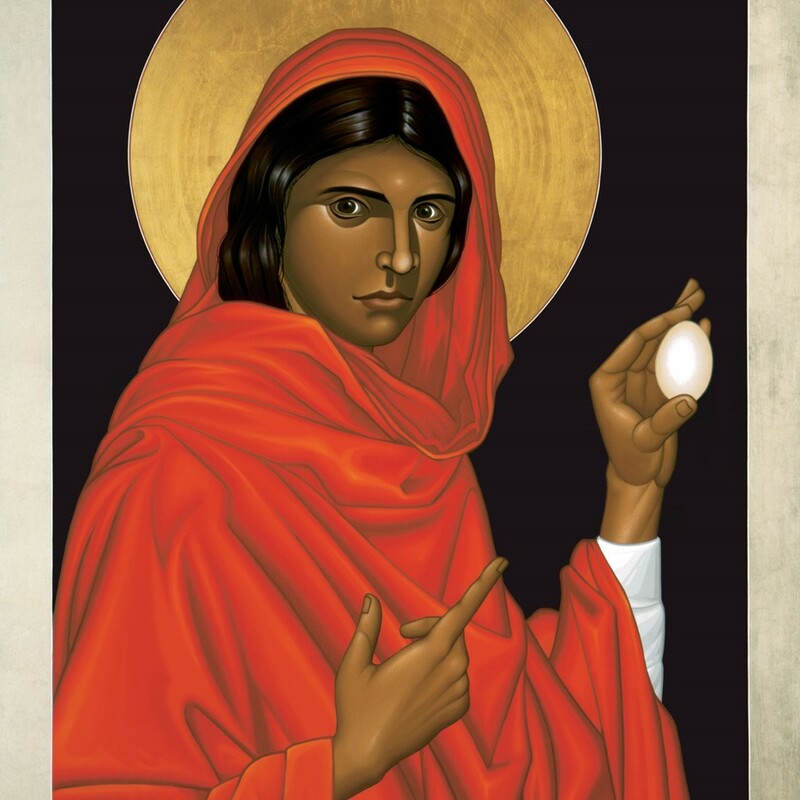 Immediately, the egg miraculously turned red in her hand. It is because of this tradition that Orthodox Christians exchange red eggs at Easter. The hints about maybe being Jesus’ wife are enticing and get a lot of attention, but whether she was or not, she was a significant leader in spreading the teaching of the new faith. Our Unitarian and Universalist roots are in liberal Christianity, a Christianity which has always affirmed Jesus’ resurrection not as a metaphysical or supernatural event but as an ethical renewal of the world. This renewal will not be easy, for the costing price of love is high. Mary Magdalene is a symbol that represents those of whatever gender who stayed behind, weeping. Powerfully we see how we must confront death, how our lives are about losing forever the thing we love. Death and loss come. Hope comes: the morning light, the garden, the angels. Life is there, it calls our name, and we reach out to embrace all that we can – even though we sometimes recoil from the isolation and separation that seems to be part of this momentous task of being human. In the depth of our grief we must not only let go of our expectations of living in a perennially joyous garden, but we must go our way alone with the commission to speak all of what we have seen and felt. It is a commission of compassion: to apprehend that the suffering of others is your suffering -- like Mary beholding the suffering of Jesus, and taking it as her own. Or like the two girls in C.S. Lewis’s remake of the Christian story, The Lion, the Witch, and the Wardrobe, who stay behind to witness the death of Aslan, the great Lion. The girls wept the night through stroking Aslan’s shorn mane. Those who stay, who are there, who bear witness and break silence, somehow give us the courage to do the same. We can’t say exactly what happened to Jesus 2000 years ago. We weren’t there. We’re here. Yet here is there. Like Mary, we have been left behind to tend to our tears and tend to earth’s garden. We smooth-skinned primates haven’t yet botched it entirely. Our coming together in tender moments is defying death by holding it in our hearts, holding the suffering and the joy, loving the light of every passing day. During daily life and even during times of danger we stay present to love. We could give in to the fear of losing what we love most because the earth is covered in ruins, in secrets, and in ashes. It’s also covered in roses, in songbirds, and in the laughter of dear friends. Lo, the Earth awakes again from the winter’s bond and pain. Alleluia. Alleluia. This is part 3 of 3 of "There's Something About Mary"
whose earlier sermon, "Were You There?" were adapted for this sermon.